Serving in the region of 11 million passengers per year, Bali International Airport (DPS), or Ngurah Rai International Airport as it is otherwise known, is Indonesia's second-biggest airport and provides an essential gateway for holidaymakers seeking the tropical paradise of the island of Bali. The airport resides in southern Bali and is just 15 km / 9 miles from nearby Denpasar, the region's capital city, and also close to Boealoe, Djimbaran and Kuta. Ngurah Rai Airport is a dual terminal facility, handling both domestic and international flights, with around 25 different airlines in total. Indonesia's very own Garuda Airlines (Perusahaan Penerbangan Garuda Indonesia) is particularly notable and features flights to Australia, Japan and Singapore. Public buses run to the bus station in Denpasar, or alternatively there are taxis, commercial shuttles, courtesy shuttles and luxury limousine services to take you to your destination quickly and comfortably, travelling to Kediri, Menguwi and Sempidi, and beyond. A good selection of car rental companies are also on hand and include some internationally recognised names. Bali is an Indonesian island and a popular tourist destination that offers visitors a rich cultural experience combined with tropical beauty and a solid tourist infrastructure. The island is famous for its arts, both performing and creative. 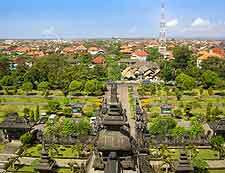 Denpasar is located on the southern side of Bali and close to Ngurah Rai Airport (DPS). Visitors to Denpasar and other popular spots can enjoy local theatrical dance performances, or view wonderful ethnic artworks in medias such as sculpture, leather, metal and paint. Bali's most significant tourist areas include Kuta, Sanur, Jimbaran, Seminyak and more recently Nusa Dua.